Well, Gmail has been down for a while today. I’m hoping it will come back up pretty soon, but if you’re also getting an Error 502 message then you may be waiting for a while as well. I did a little research (google is your friend..unless it’s Gmail with a 502 message, haha) and it looks like it happens fairly often to people. One person reported not being able to login for up to 4 days! I also read that sometimes logging in with a different browser will temporarily fix the problem, but it didn’t work for me with Opera, Firefox or Internet Explorer. Hopefully everyone else is having better luck. 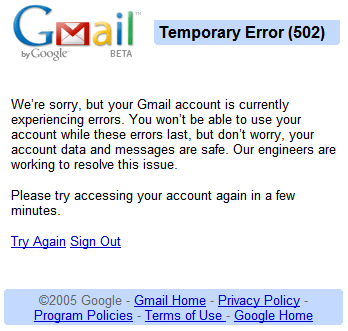 Since about 2 p.m. Pacific Time today, many Gmail users have been unable to access their email. We are very sorry for this interruption in service. The issue is being caused by a temporary outage in the contacts system used by Gmail which is preventing Gmail from loading properly. We are starting to roll out a fix now and hope to have the problem resolved as quickly as possible. Even though you may not be able to get to your inbox right now, your mail is safe, including new incoming messages. We will post an update in the Gmail Help Center ( http://mail.google.com/support/ ) when more information is available. Gmail seems to be back in order now and apparently came back online around 8pm EST. Hopefully no one is still affected by the outages. After getting the gmail server error 502 I retried using Chrome (google’s browser) and it worked like a charm, while in Mozilla Firefox I kept getting the error 502.